The casting of glass is an ancient technique traced to the Egyptians and perhaps earlier. It is now used in many different ways by both contemporary artists and industry. In this workshop we will explore several methods of forming original models to be replicated in glass and some ways of making the mould to hold the glass during the firing. You can work from both found objects and/or models made from wax or clay. Assistance will be provided in developing inspiration and ideas as well as drawing skills plus calculation of materials quantities useful in planning the castings. The processes we will use are relatively long and in order to complete two or more works in the workshop we will work quickly and to a size that will suits our purpose. Cast works are commonly polished by either hand or machine processes. Techniques in both will be taught. You will be able to continue the hand techniques at home without elaborate or expensive equipment. Illustrated lectures detailing methods and demonstration of complex techniques will be provided. The ‘double firing’ technique which creates one cast glass piece inside another will be shown. This workshop is suitable for both experienced glass artists and beginners. It will be taught in English with translation to Turkish and Chinese available. Dr. Donghai Guan has a long history in contemporary glass and is experienced in many techniques. 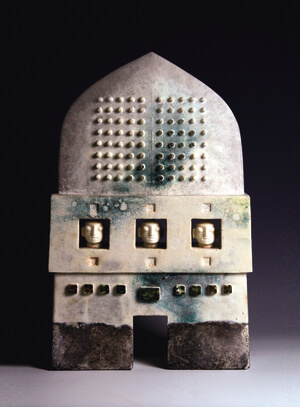 For the last decade he has concentrated on kiln casting.